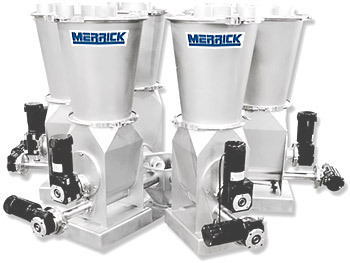 Orbital Feeders | MERRICK Industries, Inc.
A single Orbital Feeder provides excellent Loss in Weight control and accurate metering of material. 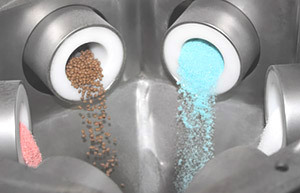 Its greatest strengths are even more apparent when groups of Orbital Feeders are used to simultaneously feed multiple materials into a blending process. Hoppers, augers, agitation, spouts and motor drives can be configured within a production run as needed. In a blending process it’s important to be able to handle many different materials at various feedrates. Changing from one material to another and from a high range of feedrates to a very low range requires the flexible capabilities of the Orbital Feeder. Each Orbital Feeder has components which can be quickly and easily changed for material and recipe changes. What best states your accuracy requirements?